The Phil Ceberano ‘Rock Party’ band is a compact and versatile 3 – 9 piece band suitable for bars, clubs and private functions & corporate events. With Phil Ceberano on Lead vocals and Guitar, Thom Mann (Drums/vocals) and Stephen Hadley (Bass and Vocals) the Phil Ceberano party band are a formidable line up delivering high quality party music for people that want to let their hair down and have a great time. For parties where an extra flavour is required, Phil invites keyboard and sax player Glen Riether (John Stevens band) to add to the sizzle factor. Phil and his band have been playing together for over ten years and are the backing band for the fabulous Kate Ceberano on her many tours and corporate performances. They are consummate professionals and always put on a great show. The audience having ‘the time of their lives’ is the Phil Ceberano Party band’s priority. Phil’s been working in the entertainment industry both locally and internationally for over 25 years as professional musician, actor, TV presenter, producer, musical director and composer. He is predominantly known for his musical achievements and is regarded as one of Australia’s greatest guitarists. He has travelled extensively throughout Australia, Europe, the UK and US providing him with invaluable experience as a live performer. Phil joined forces with sister Kate Ceberano in 1985 Her debut solo album, ‘Brave’ sold triple platinum. Phil has continued working with Kate as her guitarist, collaborator, co-writer, co-producer and bandleader on Kate’s tours and albums up until the present day. 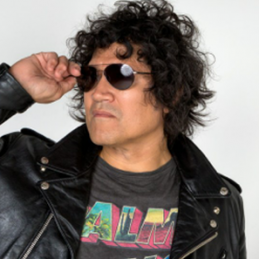 As well as working extensively with his sister, Phil has formed and played in many other bands including well known Melbourne band Sexual Chocolate (87-93) and Trentwood, a power rock trio who toured throughout Australia, playing over 400 gigs in four years. He’s also worked as a composer & session player on music for film and television. Phil & his band, The Phil Ceberano Band, are continuously invited to play for exclusive VIP parties and media events. He’s established an outstanding reputation in his own right as an entertainer who delivers a great show every time. Phil’s experience in the field of entertainment extends beyond music. He’s also worked as a professional actor in theatre and feature films and a presenter on MTV. Phil is a motivational speaker and MC and has spoken in over 500 schools nationally since 1997. Communicating and interacting with people comes naturally to Phil. He has a real knack for making people of all ages and cultures feel at ease, whether it be in an intimate interview situation or within a large group of people. Phil is a true entertainer with a magnetic personality. He has a real passion for life and is an energetic performer with a brilliant ability to connect with not only an audience but with individuals.